This post is from 2006, and might still be useful. There are now 840 posts on the VO blog. You'll find more worthwhile info in the archives. I bought some old Dia Compe 980-R brakes on E-bay. They were made in 1983 and didn't seem to have been cleaned since. 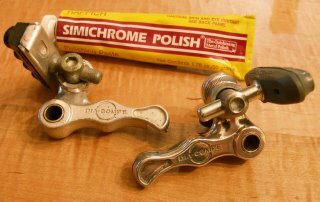 So I poured a glass of wine, sat down in the big leather chair, and started polishing one of them with Simichrome. In about 10 minutes it looked like... Well click on the photo to enlarge it and see for yourself. Simichrome polish is made in Germany and it's not cheap, nor is it easy to find. But it is the best and a little lasts a long time once your cloth is saturated. It does a great job on non-anodized aluminum, chrome, brass, stainless steel, and silver, perfect for brass bells. It also leaves a thin film that protects the metal. We still stock Simichrome; you can find it here. I really liked the Tektro FL750 levers from the moment I first saw them. They combine a clean moderniste shape and Tektro's usual high quality. But the black clamp wasn't quite right, so we asked Tektro to make us some with silver clamps. Now they are stunning. They fit 22.2mm bars. 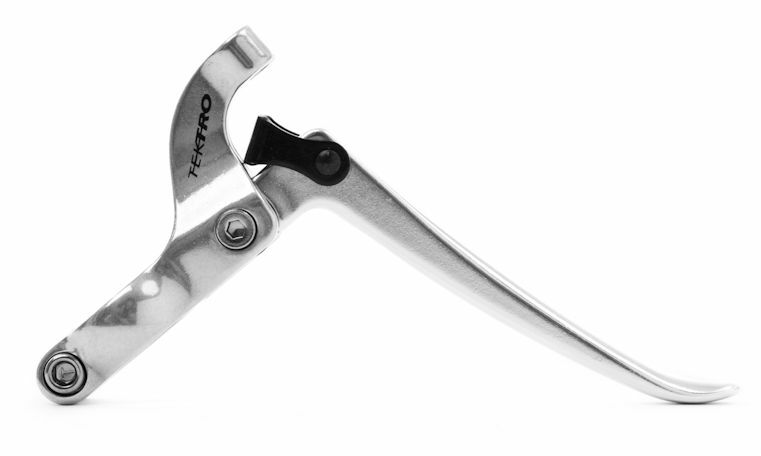 If you prefer a MTB style lever, check out the Tektro FL740 levers. The new version has red quick releases. I wasn't sure about the red at first, but they are kind of cool once on the bike. For the true retro look there are always the inexpensive, but classic, VO City Levers. 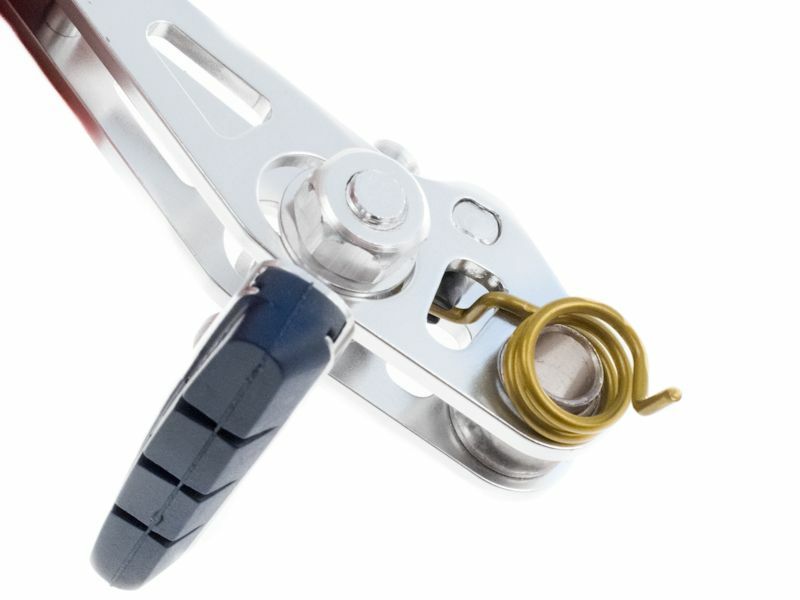 Dia Compe Guidonnet Brake Levers are another great choice. Who would have though, ten years ago, that brand new guidonnet levers would ever be available again. Finally there are two inverse levers, the Tektro RX4.1 and the Dia Compe inverse levers. The latter are available to fit 22.2 or 23.8mm bars. I think it's pretty great that we can build practical and great looking city bikes without searching for parts on E-bay or at swap meets. Are we in a new golden age of sensible bikes? Don't forget to attend the VO Yard Sale this Sunday. In-person only. No internet orders, sorry. The Zeste brakes may be the most powerful canti-brakes we've tried. This is due to extra-long arms for increased mechanical advantage. Need to stop a loaded touring bike down a steep mountain pass? They use a double plate design for superior "mud-clearing" for those of you who ride dirt roads or Cyclo-cross. The low-profile design helps them clear luggage and, on small frames, your heels. But just as important is their excellent adjustability. 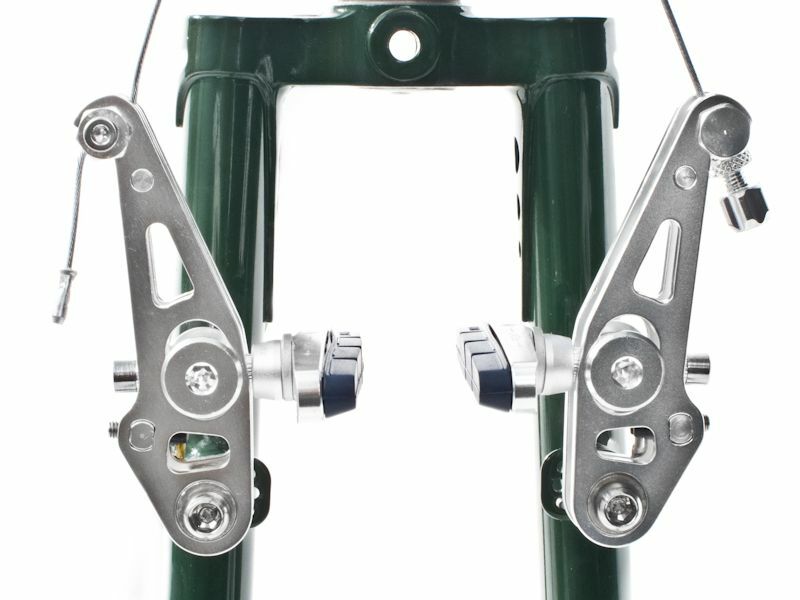 There are spring tension adjusters on each arm for easy centering. 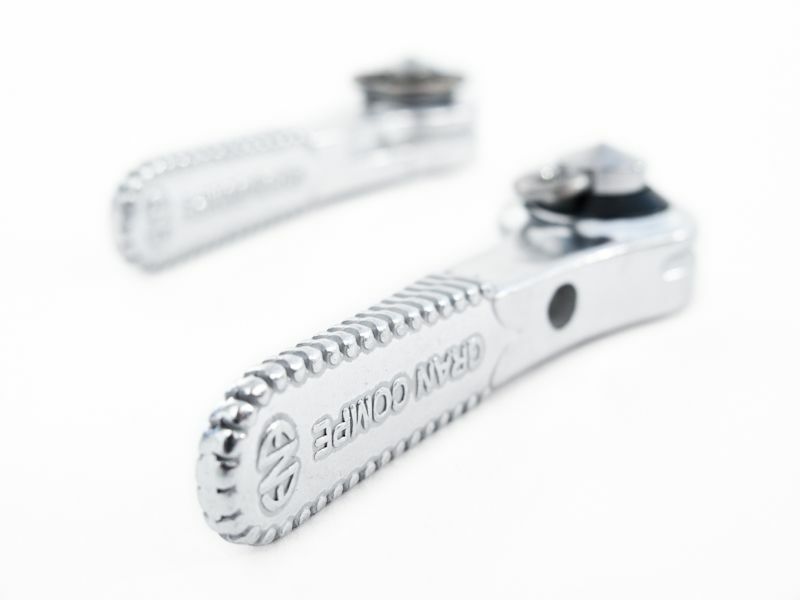 Up and down adjustment in the brake pad slot result in greater frame and fork compatibility; not all canti studs are in exactly the same place on every bike due to manufacturing tolerances or intended specification. An adjusting mechanism at the end of the straddle wire easier setup and fine tuning for perfect clearence and wire angle. You'll wonder why all canti brakes don't have these adjusters. Brake pads have adjustable toe-in, offering superior stopping power over most OEM pads. The pivot bolts and washers are stainless steel for long term corrosion resistance. Price is for two sets, or a bike's worth. 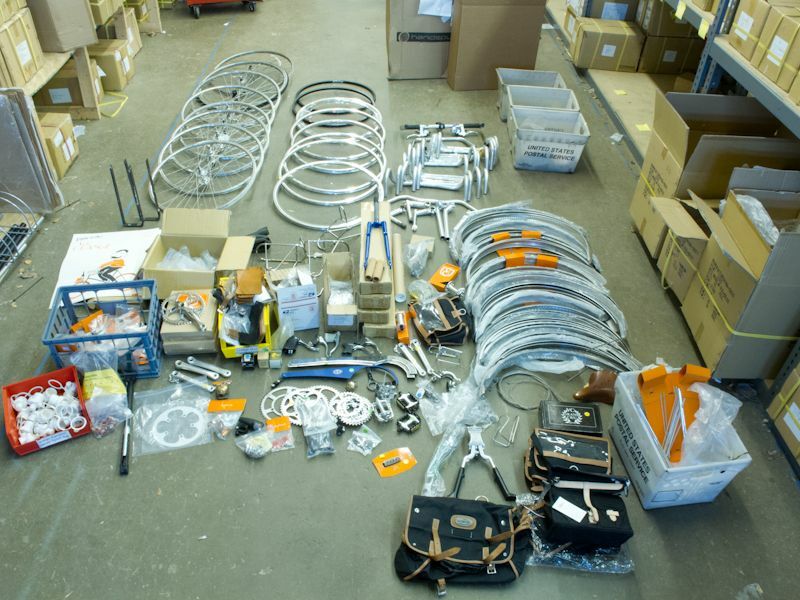 Including straddle hangers, mounting bolts and cable end caps. Sliding the arm onto the boss, note the spring's position. 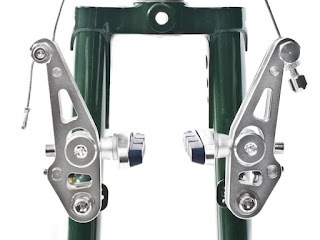 Setting up these low profile canti-brakes is pretty easy, but it's important to pay attention to the height of the straddle wire hanger, or yoke. It's height determines the "yoke angle" and thus much of the mechanical advantage of the brake system. If the hanger is too low, you'll have amazing stopping power, but poor modulation and excessive lever travel. If too high you'll have to squeeze the brake lever very hard to get good braking. As your pads wear the yoke angle changes; the yoke get's higher when the pads contact the rim. Use the adjuster at the end of the straddle wire to shorten the cable and compensate for wear. The yoke is at about the right height for this Polyvalent. 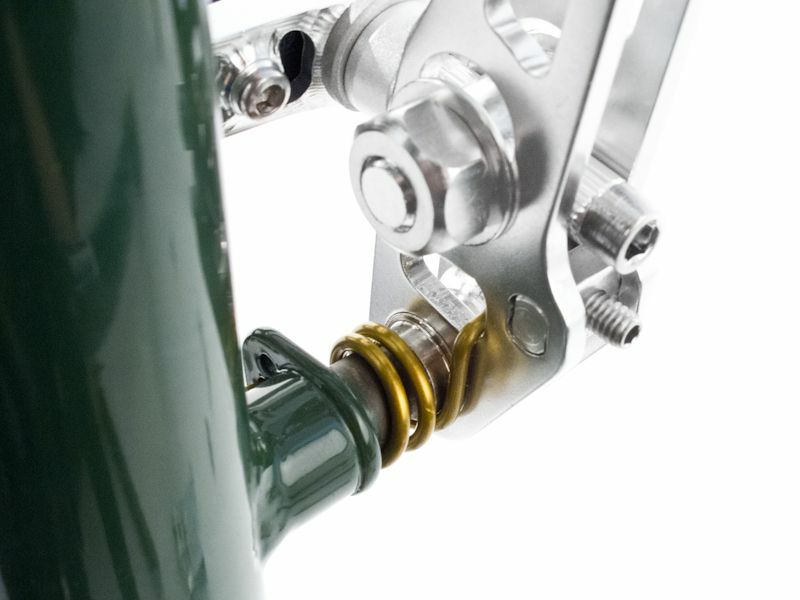 The exact height of the yoke will be based on rim width and on the exact position of the canti studs on your fork. But the photo above will give you starting point. Our Zeste support page is here. Starting to sort out the sale pile; there's more. We're selling sample parts that were sent for review or displayed in our showroom. 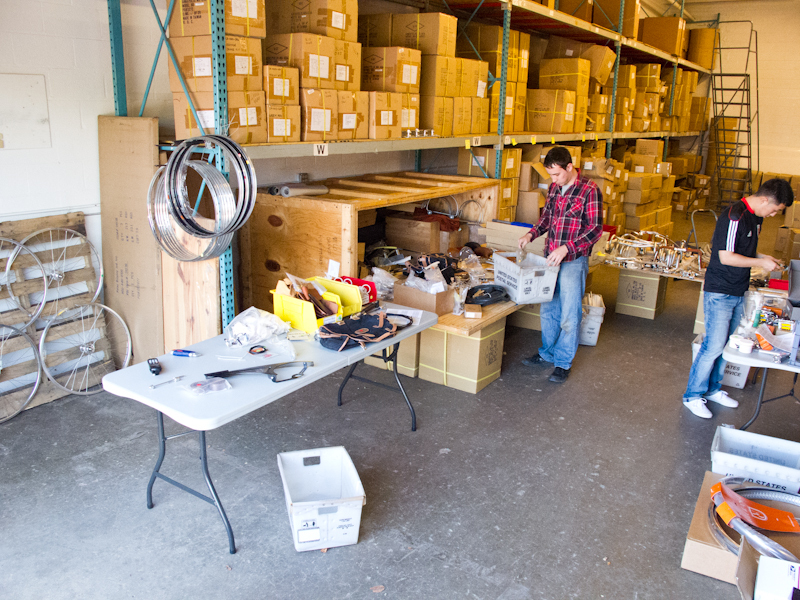 There are some returns and a bunch of prototypes, some discontinued parts, parts that have been used on test bikes. All-in-all there are hundreds of items. We want to blow them all out in one day! So most will be priced at about half the regular web site price. In case you can't find any garage sale stuff you like, we'll offer 15% off on any parts, accessories, or frames (but not mini-build kits) in stock. This reflects our savings in not having to process, pack and ship, so you must be here to get the discount. 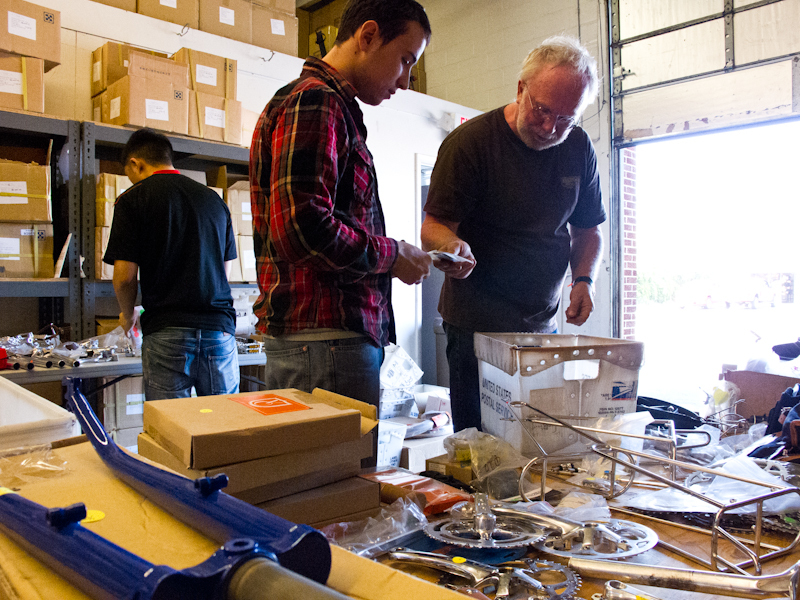 The VO Garage Sale will take place between 9am and 12pm on Sunday April 22nd, rain or shine. Here are a few new developments that may interest you. This is the little model name decal that will go on our Polyvalent-700/Campeur frame. 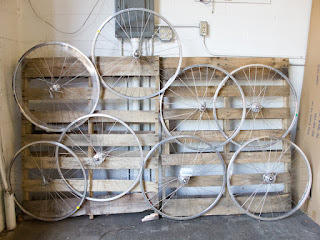 The frames are now being made, but we don't have an ETA yet. The drawing is by artist and writer Dan Price. He's an amazing guy; check out his web site. Our long delayed container is here and we have a couple of new products. It may take a couple of days to get everything checked and entered on the site. The next shipment, in about two weeks, will have all our rims and hubs along with a few miscellaneous components. The amazingly powerful Zeste brakes are here; I'll write more about them soon. The new Grand Compe ENE shifters have also arrived. 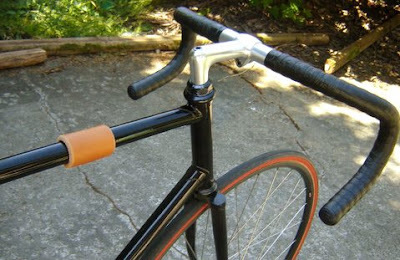 We have both the down tube and the bar end versions. These use the same internals as Silver shifters, but have more attractive levers. they also use the newer and stronger friction washers. We also have more 50.4bcd double hardware that many of you were waiting for. We are changing the finish on our seat posts. They will be machine polished rather than hand polished. The advantage of this is that diameters will be more consistent. In the past we had issues with over enthusiastic polishers polishing them so well that they ended up slightly undersized. The disadvantage is that they will not be quite as shiny. 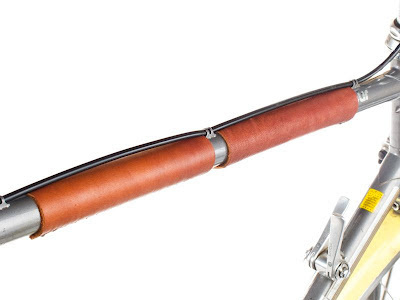 In our early days we sold this VO leather track style top tube protector. It was made from very thick leather and intended to protect your top tube from being dented when track bike handlebars slammed into it. Bikes with brake cables usually don't get these dents because the brake cables "slow" the bars. Folks still email occasionally asking if we have any left. 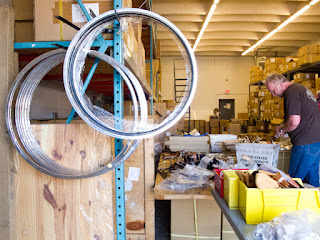 Igor, our warehouse manager, wanted a top tube protector for a different reason. He wanted to protect his paint when he leaned his bike against a parking meter or street sign. But he didn't like the BMX-style top tube pads sometimes used for this purpose. So Igor made the protector below out of the elk hide that we use for bar covers. I think it's a pretty good idea. 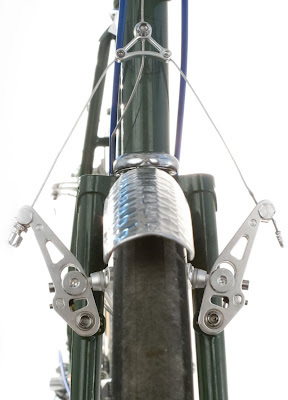 It would work even better on a bike with a run of cable, rather than cable housing because it would fit under the wire better. Or you could sew it over the housing. In any case, do you think this is something we should make?